Leslieville, still feels very much like a small village. It’s cozy houses, quaint stores, and tree lined streets, seem surprisingly serene and peaceful considering Leslieville’s close proximity to downtown Toronto. 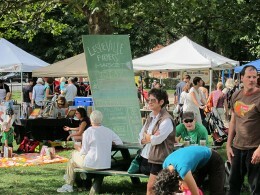 Leslieville began as a small village back in the 1850’s. The village grew up around the Toronto Nurseries owned by George Leslie and sons, after whom this neighbourhood is named. 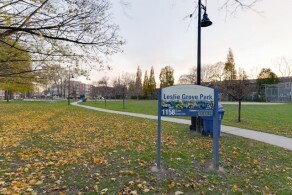 Most of Leslieville’s residents were either market gardeners or were employed at one of several brick making companies that used to operate in the area. One of the first buildings in the village was the Leslieville Public School, built in 1863. Leslieville’s first principal was Alexander Muir who composed “The Maple Leaf Forever”. Muir’s poetic verse was inspired when a brilliant autumn maple leaf fell from a Leslieville tree onto his jacket. 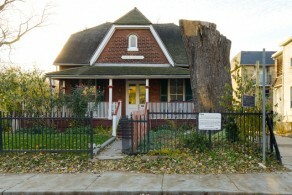 That maple tree is still standing today and has become Leslieville’s most famous landmark. It is designated by an historic plaque at the intersection of Laing Street and Memory Lane. 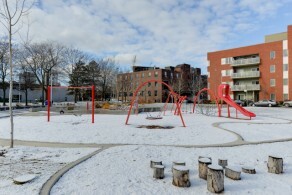 The new Joel Weeks Park, which expands on the former Joel Weeks Parkette, resulted from a unique planning framework that included a land exchange between the City of Toronto and Toronto Community Housing as well as the permanent closure of a street right of way through the neighbourhood. The beautiful park features a modern a splash pad and playground. River plantings and sinuous benches frame old and new park elements. 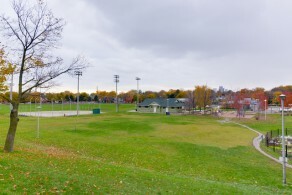 A central gathering space connects other park elements including community garden plots, a multi-function sport court, a bosque of birch trees and large grassy berms. 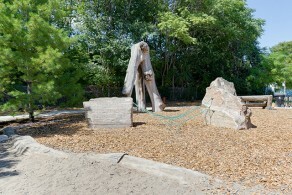 A large children’s play area includes a play structure, swings, and natural play features. An urban ‘river’ element including a bridge wraps around a water play area with jets. 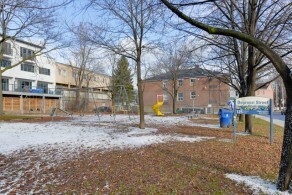 Joel Weeks Park is a dynamic and active community open space that will grow and evolve with the neighbourhood. 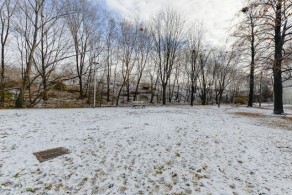 This a a conveniently located park featuring right off of Queens Street East with an off leash dog area as well as several benches for relaxing while your pooch plays! 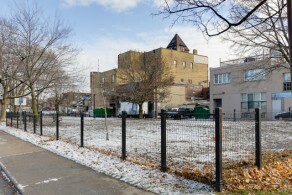 Saulter Street Parkette is nestled away from the hustle of the main streets and is situated at a dead end off Saulter Street south of Queen Street East. This is a beautiful park surrounded by trees and has several benches to be able to take in the scenery, it is a great quiet spot for walks and picnics. Although a bit older the park itself is quite spacious and is surrounded on all sides by neighbourhood. 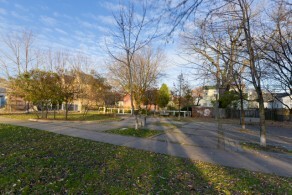 It is large enough to do a number of sport activities and safely sequestered from main streets featuring a small playground area in a residential area. 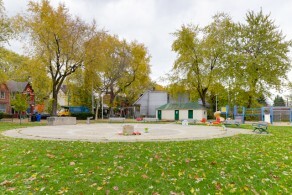 A small park on Queen Street East at Jones Avenue that features a ball diamond, a wading pool and a children's playground. Leslie Grove Shack is located inside Leslie Grove Park. The shack offers youth program on Friday nights. Ashbridges Bay is home to an outstanding skateboard park that can be found in the northwest corner. As Ontario’s largest skate park, Ashbridges Bay Skatepark, includes replicas of many downtown Toronto hotspots. 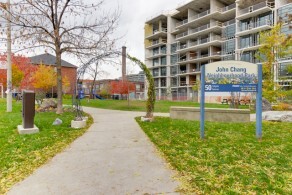 Jonathan Ashbridge Park is a 1.1 hectare park west of Coxwell Avenue that connects Queen Street East and Eastern Avenue. 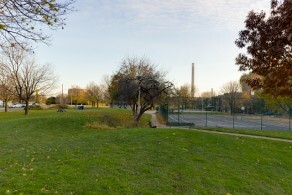 The park has two outdoor tennis courts, a wading pool and a children's playground. Bacon fest is held here as well as the Lesleville Farmers Market. Walk through the pergola arch of the Maple Cottage along the walkway from Laing – you will find yourself in the sunny Maple Leaf Forever Park behind the cottage. This is the ideal, green playground for Leslieville kids to kick around a soccer ball or take shady shelter in the lilacs planted at the edge. Greenwood Park has three baseball diamonds, an artificial ice rink, a pool, and a playground. It is recently undergoing a big revitalization at the north end. 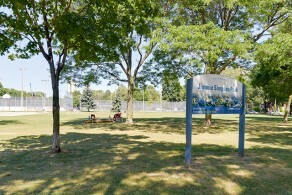 The 1.1 hectare park at Pape Ave and Gerrard St East features a ball diamond, basketball court, wading pool and children's playground. 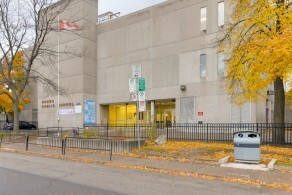 The Matty Eckler Community Recreation Centre can be found at the west side of the park. This charming park features a dog off-leash area, a paved small multi-use pad, a wading pool and a children's playground. It lives up to it's name as it is surrounded on all sides by an alleyway with garages and homes with no official road in. Small park featuring some open space with multiple benches, picnic table and a small playground. 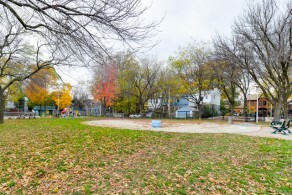 The Morse Street Playground features a good size playground and a wading pool. 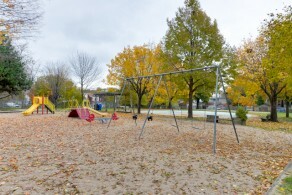 A unique feature of this park is that people in the close community drop off used children's toys usable by all children visiting the playground such as trucks, shovels and pails. The market runs from May to October, on Sundays (9-2), which is the perfect time for a farmers' market. Rather than rushing in on the way home from work, you can spend some time snacking, relaxing, and chatting with vendors whom are very friendly.The market is in an open park area, so there's lots of room to wander around. The fifteen or so vendor booths are set up in a circle around a central area where music and families can be found lazing on blankets and enjoying the sun. There are a few places serving up snacks to nibble as you wander around including one vegan place, one gluten free bakery, a place doing waffles, and a fish stand frying up fish cakes, as well as mugs of locally roasted coffee. There's a couple of beef/pork vendors as well as local fish, a specialty garlic vendor, and a good selection of produce-sellers among other things. 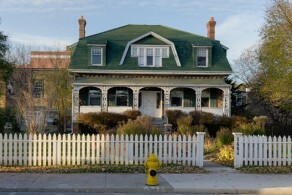 The Ashbridge Estate is an historic home in the east end of Toronto. 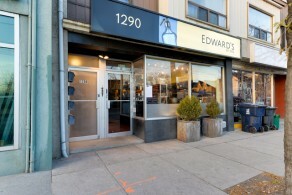 The building is located on Queen Street East near Coxwell Avenue in the Ashbridge's neighbourhood, Toronto between Leslieville and The Beaches. It is the earliest known site of residential inhabitation in the east Toronto area. The Ashbridge family came from Pennsylvania to what was then an area outside of York. Sarah Ashbridge was the head of the household and brought with her an extended family, 2 unmarried sons, 3 daughters--one unmarried--2 with husbands and family in tow. Sarah Ashbridge was a widow. 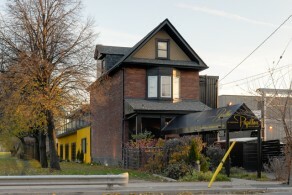 Hidden away on quiet Laing Street that runs between Queen Street East and Eastern Avenue is a little piece of Canadiana that most Torontonians might be unaware of – Maple Cottage. Standing at the corner of Memory Lane, Maple Cottage is named for the late tall silver maple said to have inspired Alexandar Muir to write The Maple Leaf Forever in Canada's Confederation year 1867.The most important part of the transformation has been the gardens, planted in the Victorian style to match the vintage of the charming worker's cottage. Although the tree was blown to pieces in a storm in the summer of 2013, the cottage remains, and you can follow the walkway from Laing through to the sunny Maple Leaf Forever Park behind the cottage. An Italian favourite with a selection of creatively dressed pizza pies and microbrews, Lil’ Baci’s Pizza offers a slightly upscale twist to the classic pizzeria. 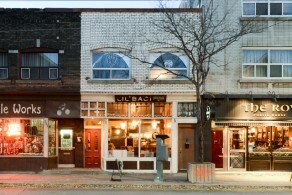 At Lil’ Baci, you will find a very approachable, value-driven Italian wine menu along with hand-crafted Ontario beers to complement the hand-crafted pizzas. They have alternative options such as the organic kamut/spelt pizza crust also they are kid-friendly with high chair & stroller seating. 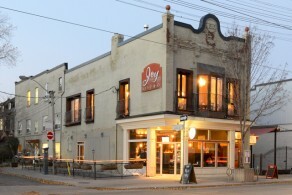 Joy Bistro is one of the hot spots of the trendy Queen Street East strip. Surrounded by the cozy, candlelit atmosphere, Joy delivers a diverse menu along with generous portions at modest prices. The service is fast, friendly and attentive. Joy Bistro offers breakfast, brunch, lunch, and dinner. The food at Joy Bistro has been described as fresh innovative, comfort food with global influence. Lastly, they have a simple yet solid wine list with many bottles under $30. This establishment is named Ascari Enoteca after 1950's Italian racing legend, Alberto Ascari. 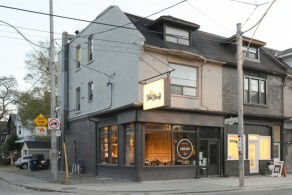 Located in the heart of Leslieville, Ascari Enoteca is a neighborhood locale where people come to linger over a simple, delicious meal washed down by an oustanding bottle of wine (or two). You'll find homemade pastas made fresh in house every day, plus a wine list featuring well-known varietals from across Italy and more than a few undiscovered gems. 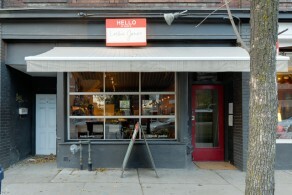 Leslie Jones is a Leslieville hotspot where you find quality food in a cozy atmosphere. This is the type of place that quickly finds a spot on your list of favourite restaurants due in no small part to the wonderful staff and reasonably priced menu. A focus on using the best locally sourced ingredients results in raves for dishes such as the Jerk Pulled Pork with Fresh Mango Salsa and Chili mayo, Roasted Duck with Fennel in a Fresh Herb pastry and a taste of yesterday with a traditional Carrot Cake. 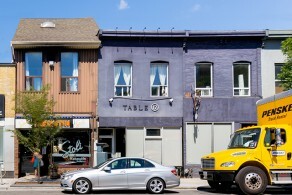 The charm of the neighbourhood's many artists and vintage shops is carried on at Leslie Jones. A rotating gallery of art work decorate the walls of the small space showing off the talent of Toronto's home-grown artists. The lush patio out back is a welcome get-away from the hustle and bustle of Queen St.
A global cuisine with influences from North Africa, Asia and Canada. Everything on the menu is under $20, and most wines are under $45, and are all available by the glass. The ethos is local, sustainable and naturally raised wherever possible. Brunch has started and Argent finally got to realize his dream of a self-serve Caesar bar, laden with all manner of extras for a truly custom hair of the dog: pickled quail eggs, pickled veggies, poached shrimp, dulse, wasabi, smoked salts and, of course, an array of hot sauces. This trendy diner has taken red booths, checkered tablecloths and a diner-style menu to new heights. At first glance, items such as creamy mac and cheese, spiced apple cider and lamb pie might make you think you’re ordering from a greasy spoon. However, take a closer look and you’ll see that this home-style cooking is as classy as the grub at a first-class café. Even the New York Times has taken note of their sleek dining room and warm décor. Menu specials change by the day and breakfast is served up all day. A fresh squeezed juice menu has a unique twist, featuring juices from wilder fruits such as guava, mango, blood orange and the healthy pomegranate. The kitchen is open for lunch, dinner and weekend brunch. Reservations are recommended for dinner; brunch is first come, first served. Queen Margherita Pizza serves authentic Italian pizza to the city’s east end. 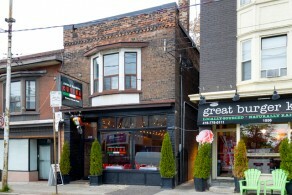 Located on Queen Street in Toronto’s Leslieville neighbourhood, Queen Margherita is no ordinary pizza joint. Cooking with a wood-oven, the restaurant has a new menu every day and ingredients come in fresh, daily. Also less typical, the restaurant is adorned with large, industrial-style windows and rustic artwork on its whitewashed brick walls. However, the higher-end food and décor also comes with slightly higher prices to match. Located between Leslieville and The Beaches, reservations are recommended, though for those hoping to try this European classic from home, Queen Margherita also offers takeout. Le Papillon on the Park is nestled in a gorgeous old restored brick house between Leslieville and the Beaches on the new Jonathan Ashbridge Park. The owners have been in the business for almost 37 years. Le Papillon on the Park goes way beyond the basic strawberry and Nutella pairing. Consider these crepes the “filet mignon” of their kind -- options include a braised curried lamb crepe, a seared shrimp and scallops crepe, and a maple roasted ham crepe with aged cheddar and maple syrup. And, um, strawberry crepes for dessert. 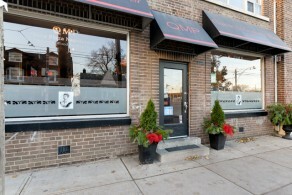 Aprile Bambina is located on Gerrard St. East in Leslieville. The philosophy is simple, fresh and homemade. Since opening in December Aprile has been a neighborhood "hot spot" with many returning guests and new ones alike. Any of the pizzas and pastas can be gluten free as well. Check out their Facebook page for regular menu specials and updates https://www.facebook.com/AprileBambina. 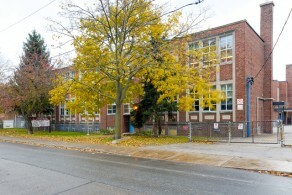 Originally named "Leslie Garden School", Bruce Jr. Public School is located in the hip Leslieville area in an area previously occupied by The Leslie Nursery Gardens. When the nursery was sold, construction started and a new school opened in 1923. Originally the area was populated primarily by a community of people with British origins. Today many of the students have English as their second language. The largest non-English speaking group is of Chinese heritage, with growing representation of other languages and cultures. They provide Junior Kindergarten to Grade 6 and have a vibrant Early Years partnership with WoodGreen Community Services, providing seamless childcare and learning opportunities for families and children of all ages and backgrounds. They are a vibrant JK to Grade Eight school that reflects the diversity and richness of contemporary Toronto. Over 100 years old and nearly 700 students reflect Toronto's rich diversity, bringing children of all backgrounds together to enhance the educational experience for all. They benefit from a School Council group of active parents, staff and community members who share a common goal - a positive and strong learning experience for all the children at the school. 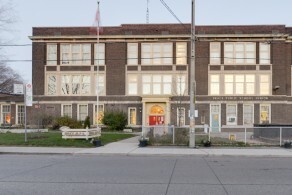 Equinox Holistic Alternative School, grades JK-8, was founded in 2009 and is located on the third floor of Roden Public School. Equinox is an open concept school and all teaching areas open onto a shared space called the "common area". Within the school, there is a large music room, an art room, an all purpose gymnasium and a fully functional library with a computer lab. 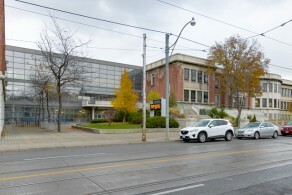 Roden Public School has been an integral part of the Coxwell and Gerrard neighbourhood since 1907. Over the years, it has undergone many structural changes to accommodate the growing needs of the student population and the community. Roden was completely rebuilt as an open concept school in 1969 - all teaching areas open into a shared space called a "common area". Within the school there is a large music room, an all purpose gymnasium and a fully functional library with a computer lab. St. Joseph School houses approximately 180 students. This is a community-based school that works closely with the Church and Parent Community. The students come from all walks of life. Because St. Joseph offers programs in Learning Disabilities, Multiple Exceptionalities and Language Instruction, many of the students in these programs are bused to the school from surrounding communities. St. Joseph School also has 8 regular classes including two all day kindergarten classes. In addition, they have 1 Special Education class to service students with special needs. Vocal music is offered to students from J.K. to grade 5 and instrumental music is offered to students in grades 6-8. Their staff is made up of 15 teachers, 2 CYW, and 5 EAs. 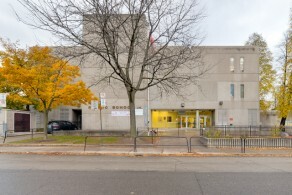 Leslieville P.S. 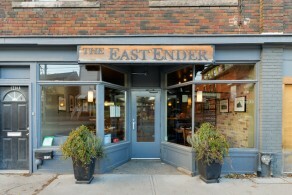 has enjoyed a proud history in the Leslieville community. Today the school promotes academic excellence, offers a wide range of extra curricular activities including sports, writers clubs and choirs. 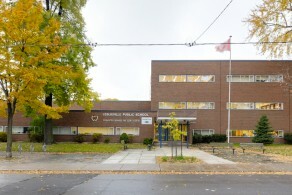 Leslieville has about 350 students in Grades JK to 6. 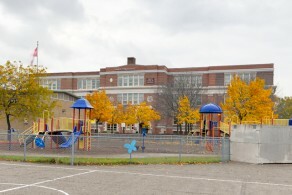 It is a community school with an active parent council. They provide a wide-ranging curriculum and extensive extracurricular program. Their school provides programs for kindergarten to grade six classes providing a full time music teacher and a full time physical education teacher. They also have three special needs programs that service children from our own community and the wider community as well. Since 1907, Riverdale Collegiate has established a reputation for academic excellence. Grades 9-12 with over 80% of graduating students entering post secondary education and one third of graduates are Ontario Scholars. Riverdale is home to a modern library and many computer labs allowing students to both study and utilize computer technology. The academic program is complemented by a wide variety of clubs and sports such as: Riverdale Against Discrimination, recycling, yearbook, archery, basketball and field hockey. In the Extended French program students can earn a Bilingual Certificate. 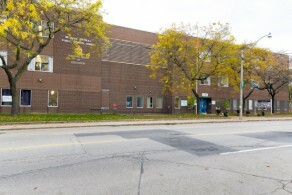 At Morse Street Public School they nurture the partnership of students, staff, and parents to create and sustain a safe and caring environment where each child has the opportunity to explore and develop his or her academic potential and acquire the knowledge, skills, and attitudes to become a responsible member of our Canadian society. They strive to foster independence and initiative in their students as well as the ability to work co-operatively with their peers and with adults. The diversity within the school’s walls gives them the strength to build an inclusive, vibrant school community that encourages active participation in all aspects of school life. Welcome! Grades JK – Grade 6 offering French Immersion.